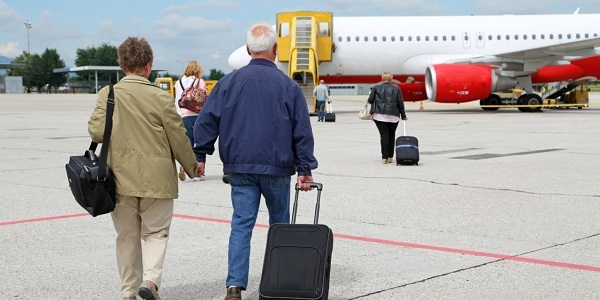 Taking a flight if you have dementia can present a few challenges, so what steps can be made to make the experience smoother, and what are airports and airlines doing to help? Unforgettable, the organisation that was set up to assist those with the affliction, offers its advice. Having dementia doesn’t always have to mean that travelling and holidays are off limits. How are you supposed to complete your bucket list if you can’t fly to places you’ve always wanted to see? But visiting an airport can be very overwhelming if you have dementia. After all, it’s an enormous building filled with thousands of people who are all in a hurry to get somewhere. Then there’s the heightened security, checks and rules, all of which need to be obeyed – which isn’t easy when you’re struggling to understand instructions. The sheer size of airports mean it’s easy to get lost or lose someone, even if you’re not easily disorientated, so imagine how confusing it could be for someone with dementia? And if you forget something – a handbag, boarding pass, bag of duty free – which can happen easily if you have dementia, it’s not always simple or straightforward to get it back. However, if you’re aware of these challenges, it is possible to prepare for them and ensure that travelling by air is as stress-free an experience as possible. First off, you need to decide whether the person with dementia can travel alone, or if they’ll need to be accompanied. Be honest with yourself about their needs, because if they’re already struggling with things like mobility and incontinence, they’re not going to be able to cope on their own. Flight attendants are also not expected to support people with eating or toileting needs, so you will need to be able to manage these during a flight. Before booking your flights, it might be worth contacting the airline’s special assistance team to find out what help can be organised on your arrival at the airport, or whether a note can be put on the system when you purchase the ticket. Go to the end of this article for more on where you can find out these details. You may be able to request certain seats when you book. If a loved one with dementia has limited mobility and doesn’t like to have their legs cramped into one position for a long time, you may be able to request seats with more leg room. However, be aware that a person with cognitive difficulties, limited mobility, hearing or sight impairments or anyone who struggles to understand or react to safety instructions will not be allowed to sit in the emergency exit rows. This is a standard safety practice followed by all airlines. If you’re given the option, it might actually be worth NOT checking-in online. By going to the check-in desk (in plenty of time of course) and checking in with one of the flight check-in operators, you may be able to talk to them about any concerns or requests that you have regarding your loved one, and they may then be able to set you up with some solutions. This is also worthwhile because it means you can double check that any previously organised assistance has been organised. It’s easy to leave a bag under a table, in a shop or on the back of the loo door, so if you’re travelling with someone who has dementia it might be worth having a joint hand luggage bag for the both of you. Then they won’t need to worry about leaving something behind. The key to coping with this part of the journey is to ensure that the people you encounter are aware of any issues around dementia. The good news is that many of the larger airports are already taking steps to train up staff so they’re dementia-friendly. However, it’s also worth being prepared to explain why someone isn’t responding in the way they should. For example, when checking in, if the person on the desk asks the person with dementia if they’ve packed their bags themselves, it’s quite possible that they’ll say no (because you did it). In cases such as this, you may need to step forward and explain the situation. Similarly, when going through security, having to separate fluids into bags, remove shoes, give up a handbag to be x-rayed and be patted down by a complete stranger could be confusing and more than a little traumatic for someone with dementia. Try to stand next to each other during the queuing process, and stand behind them during the security checks so if they’re held back, you won’t then be separated. Once you’re through security, it might be worth seeking out the quiet area of the airport. If you’re willing to pay, you may be able to get access to private airport lounges, which will be less busy. Be mindful that it might take a long time to get to the departure gate, particularly if a loved one isn’t that mobile, so you shouldn’t go too far from the gate. It can be so easy. One minute you’re testing perfumes or stocking up on Toblerone in the Duty-Free shop, the next minute your loved one with dementia has disappeared. It can be really traumatic to realise they’ve walked off so be mindful that this could happen, and prepare for it by giving them a label that will identify them and provide a means of someone getting in contact with you. Include their name, your name, a mobile number and their flight details. Put these details in a lanyard (Gatwick airport can provide one for you) or add to a badge or sticker. Once it’s time to get on the plane, make the most of front-of-the-queue boarding – it’s usually offered to those with children or who are disabled, but could also be requested for a loved one with dementia. What can flight attendants help with? Cabin crew will be happy to help with general requests, but are not to be expected to carry out jobs relating to caring, such as helping to feed someone or supporting them while they use the toilet. They may be able to help calm or distract someone with dementia if they’re becoming agitated. Take-off and landing could cause a certain amount of worry for someone with dementia, particularly as they may want to get up and walk around and this isn’t possible once the seatbelt signs come on. Pressurised cabins can cause ear pain, which may be distressing if they don’t really understand why it’s happening. Sucking on a boiled sweet or distracting the person with music or watching films downloaded onto an iPad could help. If the person with dementia struggles to chew or swallow, trying to eat aeroplane food could prove tricky. For short-haul flights, it’s probably worth ensuring you have your own food or you eat in the airport before you board. Be sure to provide plenty of fluids during the flight, as being on a plane can be very dehydrating. If someone becomes dehydrated, it can increase the risk of urinary tract infections (which can cause delirium) and lead to low energy. Everyone on a plane needs to wear a seatbelt for take-off, landing and for any moments of turbulence. This may prove tricky if the person with dementia struggles to grasp quite where they are and want to wander around. If this is the case, distraction is often the best tactic, so make sure you have something that will get them chatting or focusing on other than getting up. Remember, if the person with dementia has been asleep and suddenly wakes up, they may be disorientated and panic that they’re on a plane (because they don’t remember getting on it earlier), so try to be aware of this if they go to sleep, and be ready to calm and distract them. The toilets on planes are compact to say the least, so if a loved one with dementia struggles to go on their own or needs help changing a pad, it may be a bit of a squeeze for you both to fit in. Make sure you have everything you need to hand before going into the cubicle. Some airlines, usually operating on long-haul routes, are equipped with a wheelchair accessible toilet. However, smaller planes may have only partially accessible toilets. Remember, flight attendants are not professional carers and cannot be expected to help with toileting. Unforgettable has detailed information on what different UK airports and airlines are doing to help those with dementia.